Just finished rereading this classic by child psychiatrist Ross Campbell. 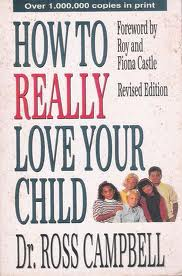 What I really love about his contribution is the emphasis on building a strong foundation of unconditional love, without which all our strategies of behaviour modification are doomed to fail! He introduces the concept of the child’s emotional tank, which needs to be full for that child to be at their best, be it socially, academically, behaviourally or in any other area of life. The only way to fill this tank is to communicate unconditional love to your child, through eye contact, physical contact and focused attention.